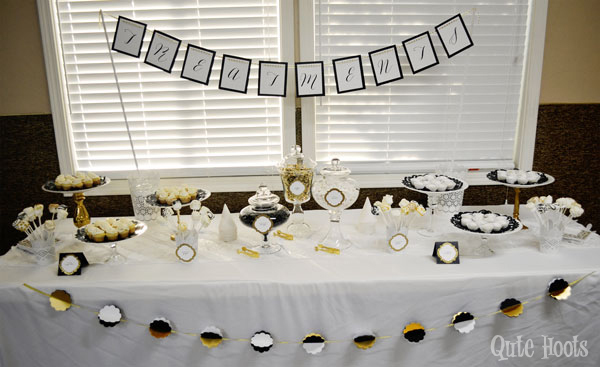 I’ve got a quick little post today for you about a surprise spa birthday party done in white, black, and gold! The Women’s Ministry team at Oakdale Family Church of the Nazarene asked me to put together some decorations and dessert table for a surprise spa party for Hope, the senior pastor’s wife. They had an Arbonne representative who would be coming to provide spa services and there would be a potluck of snack foods. I met with a couple of the lovely ladies for a planning session, and I was told her favorite color is white. 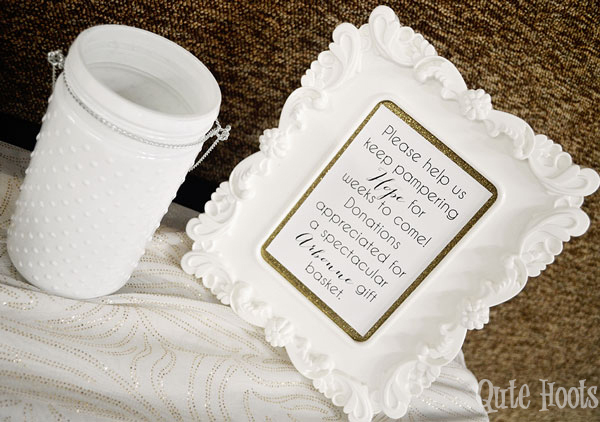 Since Qute Hoots had just designed an all white wedding, I knew it would be a breeze! 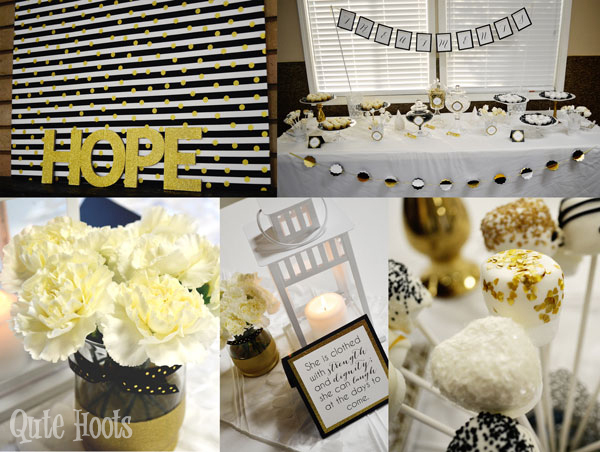 I added in black and gold to create some dimension for an elegant and fun birthday party. 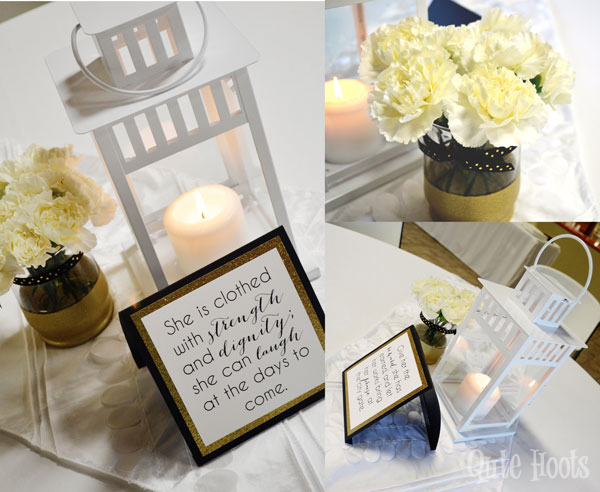 When deciding on the decor for the tables I remembered something pastor AJ had stated about Hope- that she truly epitomizes the Proverbs 31 wife. That really resonated with me so I put a portion of the verse on each table along with a lantern and small jar of flowers. The desserts table I called “Treatments” and loaded it up with super delicious and tiny items. There were vanilla cupcakes, marshmallow pops, wedding cookies, toffees, chocolate drops, and pillow mints. The key to any perfect dessert table is to make sure the colors of the treats match the theme of the party. It makes the look more cohesive! At the entrance of the fellowship hall they wanted a jar for donations for an Arbonne basket for Hope. 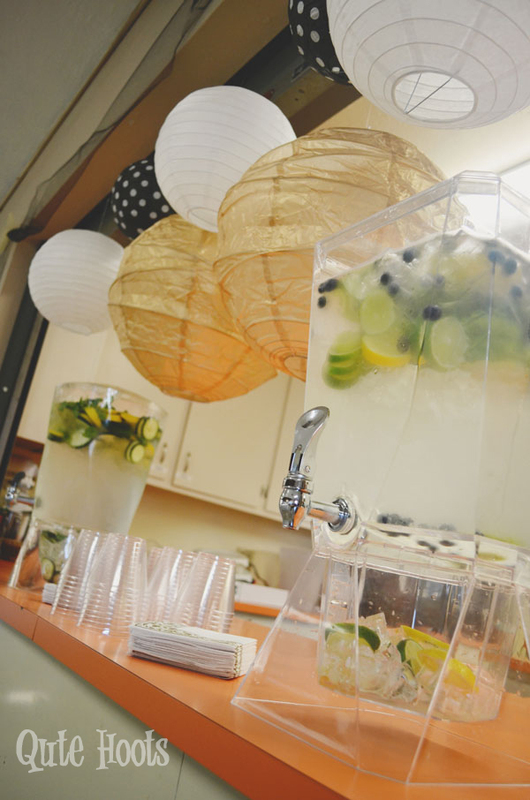 To go with the spa theme they had infused water- one savory and one sweet for all to enjoy. 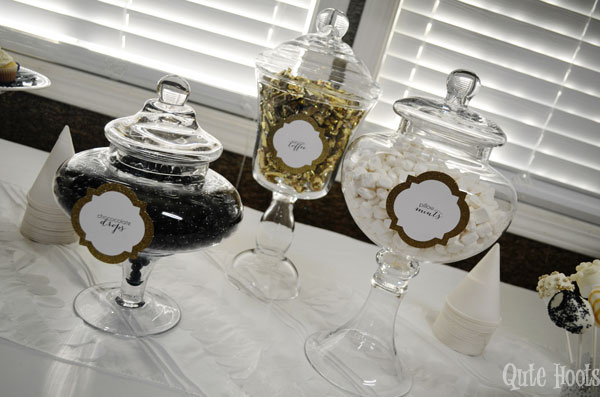 I loved this party because it was so simple and easy to put together but was so pretty!